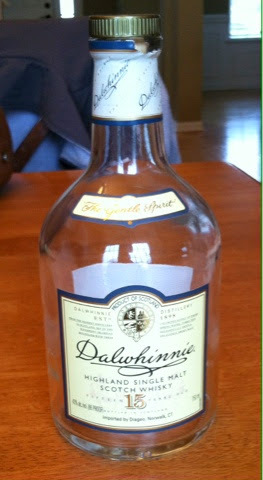 I had never had anything from the Dalwhinnie distillery before. Quite frankly, I picked up this bottle somewhat on a whim. I found it at my local liquor store, and it offered good age for the price, so I decided to give it a shot. I have to say, I'm very glad I did. I'm not one for belaboring the nose or the palate of a whisky. I like what I like. But, I will say, I love the way this whisky hits your nose! It had a very sweet aroma to it, one that makes my mouth water from five feet away. It is on the sweeter side of Scotch whiskies (though not as sweet as its aroma would have one believe), with a blend of vanilla and citrus, a relatively odd mix that I find sometimes works and sometimes doesn't. Here it does. It also has a certain amount of smokiness to provide some nice balance and prevent it from being overly sweet. This whisky was very smooth and drinkable, with minimal burn. For that reason it made for the perfect every-occasion whisky. It also may make the ideal gift for any whisky fan. While it may not wow someone, it's a safe bet that it won't offend.